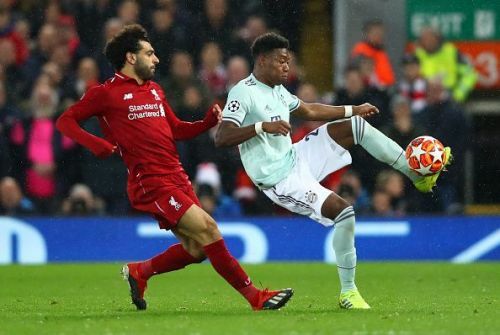 Bayern Munich face Liverpool at the Allianz Arena in Munich on Wednesday night in the second leg of their round of 16 encounter in the UEFA Champions League. The first leg was a drab as both teams tried their best but the game ended goalless nonetheless. Bayern will be hoping that home support will help them ward off Jurgen Klopp's men with ease. They have nothing to lose and will go out with an extremely positive intent. In the first leg encounter, all of Liverpool's players were brilliant except their attackers. Although Roberto Firmino was on the mark, he did not find support from either Sadio Mane or Mohamed Salah. The latter, in particular, will be keen on ending his goal drought in this crucial fixture. Midfielders Naby Keita, Jordan Henderson and Georginio Wijnaldum were lively in the first leg and one can expect a similar showing from the trio on Wednesday. Virgil van Dijk, the rock at the back for Jurgen Klopp's team, was fantastic, as always. Bayern Munich have an outstanding team on paper and they will be ruing the missed chances in the first leg. Although lesser teams would have been happy coming back from an away game with no goals scored or conceded, Bayern will be kicking themselves. Wednesday's game at the Allianz Arena in Munich will provide them with an opportunity to set things right. Manager Niko Kovac knows that he can bank on Robert Lewandowski, Franck Ribery, James Rodriguez and Thiago Alcantara at any moment and the very same players have to repay the manager's faith on Wednesday. On paper, Bayern Munich look slightly stronger than Liverpool but on the day, it will be the team which is braver and willing to press the issue that will emerge victorious. The game will be refereed by Daniele Orsato from Italy and assisted by counterparts Lorenzo Manganelli and Fabiano Preti. The VAR referee will be Massimiliano Irrati.